Electronically Commutated Motors (EC Motors) also known as Brushless DC Motors (BLDC) are synchronous electric motors powered by direct-current (DC) electricity and having electronic commutation systems, rather than mechanical commutators and brushes. The current-to-torque and voltage-to-speed relationships of BLDC motors are linear. As mentioned EC Motors are always synchronous & the conventional AC motors are not synchronous. A 2 pole motor @ 50 Cycle will run slightly below 3000rpm, whilst a 4 pole motor @ 50 Cycle will run slightly below 1500rpm – this difference in speed is commonly known as the 'slip'. Although the efficiency on a conventional AC Shaded Pole motor can be relatively good at or near this normal slip, as the motor is forced down in speed to increase this slip, the efficiency can drop away dramatically with the majority of the wasted electrical energy being turned into heat emanating from the motor coils. This has a detrimental affect on the life of the bearings and necessitates thermal devices to be added to the coils to ensure safety and prevent electrical insulation fatigue. The further we reduce the speed of the AC Shaded Pole Motor below its optimum full speed point, the more difficult it becomes to stabilize the speed and it is not uncommon for this type of motor to hunt between two speeds. An Electronically Commutated DC motor (EC) will always run at synchronous speed, with the motor coils being close loop controlled. That is unless there are other external controls; the motor speed is controlled only by the motor design and application load. Although the efficiency does vary with speed, the variation is small as compared with an AC Shaded Pole Motor. Unfortunately, EC motors are inherently more expensive to produce due to the addition of an electronic commutation circuit, however, with advances and demand in the semi-conductor markets increasing, the controls are often straightforward and relatively low cost. Q: What are electronically commutated motors? Electronically Commutated motors are brushless DC motors where the direction of the electric current is switched using electronic controllers. As the switching of the current is technically known as 'commutating', brushless motors are also called 'electronically commutated' motors. 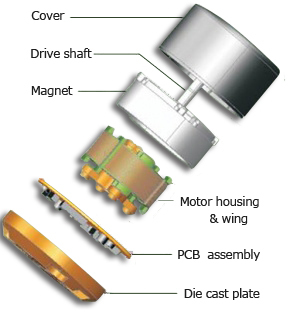 EC motors provide the advantages of brushed DC motors in terms of the ability to have variable speed control, but without the drawbacks of brushes. Q: What are the advantages of EC motors? EC motors are very high efficiency electric motors (80%) and maintain a high efficiency level at part speed. This means that in most cases they use less than one third to half of the electricity used by traditional induction motors, which in turn translates into lower operating costs and short payback periods. As EC motors have a higher efficiency this ensures that the motors run cooler in application which ensures a longer life for the motor. In terms of speed control and features, because the motor’s operation is controlled by software, EC motors allow customers to optimize and integrate the motor, fan and controller with the application, and to include features like data communications, constant volume control, variable speed. The initial outlay for an EC motor is more expensive than the traditional induction / shaded pole motors and this is mainly due to the electronic components required to drive the commutation. In recent years the cost of electronic components has reduced dramatically as volumes increase. The huge energy savings provided by EC motors, mean equally large savings in operating costs, which in turn translate in payback periods as short as a few months combined with a longer life expectancy. In our case, together with high energy savings, low use of raw material, low part count and simple electronics, have allowed us to make our motor price very competitive. Q: How are EC motors 'sustainable'? The huge energy savings provided by our EC motors directly translate into large carbon emissions savings. By using an EC motors in your application we are able to assist our customers in dramatically reducing the air pollution (CO2) generated by their applications. This is due to the motors high efficency & low energy costs which helps to preserve the world for a ‘greener’ future. EC Motors are designed & manufactured using 70% less copper and 80% less steel than traditional induction and shaded pole motors which has a dramatic reduction in environmental impact in producing these raw material components.